Whether you want to show off a single treasured memento, or you have an entire collection that you would like to put on display, we are the number one source for your sports display needs. 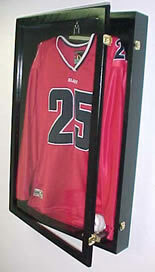 We will supply the sports display cases you need to protect and show your pieces off in style. And if needed we may be able to custom build pieces. PennzoniDisplay.com specializes in stock or custom-made enclosures that offer the best way to showcase your favorite jerseys, balls, photos, and other sports-related gear, keeping it out of the elements, but easily accessible if need be. Constructed of durable hardwoods or created purely in acrylic, these pieces are built to last and to protect your valuable sport items for decades, or centuries. You'll find jersey display cases and other types of sports memorabilia display case choices in a variety of finishes to match most any room. Tastefully displayed sport items in a game room bring the spirit in all who enter, a dramatic focal point for your family room, game room, office, or den. Get your mementos out of those plain old boxes stored in the back of your closet of in the basement or attic that you've had for years, and give them the treatment that they deserve with a display case from PennzoniDisplay.com! You can also order online by calling us at 1-800-206-6852 (We are available from 9 am to 5 pm Monday through Friday by phone). If you're lucky enough to have a memorable jersey of one of your favorite sports heroes and want to show it off, you will want to choose a display case. Display cases can add value and attractiveness to your investment by keeping it out of the dust and debris in the air, and in the condition you have received it in. By choosing one of our hardwood or all-acrylic models, you'll find the perfect way to show off your jerseys while keeping them safe and protected. It's just not right having football jerseys stored in cardboard boxes, closets or under beds are at risk of serious damage from humidity and other potential dangers. In addition, what's the joy of having something so great if you keep it tucked away where you and no one else can see it? Our sports display cases make it easy and affordable to bring your favorite pieces out for everyone to enjoy everyday. The hinged doors make it a breeze to take out your piece and show it, and the jerseys are easily viewed through the high-quality, thick acrylic viewing windows of each case. We have cases in many sizes, from the football case to jerseys, instruments and more! You'll appreciate the quality of each item offered at PennzoniDisplay.com. 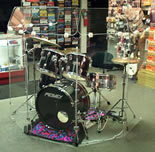 You can rely on us for displays and drum screen selections for all of your hobby, sport, and musical interests.